I’m so glad that Mike Shepard and Matt Byrne at the Sentinel/Press Herald are doing good work on exploring the budget. This is a more complex issue than a lot of the “yes/no” questions that voters get asked to consider, so this is extremely helpful in looking at what kinds of trade-offs we have to make if we no longer have the income tax revenue that was removed in the 2011 reforms. The cruel, cruel impact of the .5% sales tax was really brought into relief by the fact that purchases of a $525 television – a fairly large-scale, occasional purchase for most Mainers – would cost an additional $2. And then the suggestion that you’re really going to spend the time and gas money to avoid the extra $4 you’d spend on a $1000 washer/dryer purchase? In my Forester, the round-trip would cost an additional $70 in gas alone, according to AAA. However, the cost to municipal revenue sharing was seriously underplayed – and also not given enough context. The Press Herald and Morning Sentinel did a great job providing municipal-level data to online readers, but they’re underselling the story. 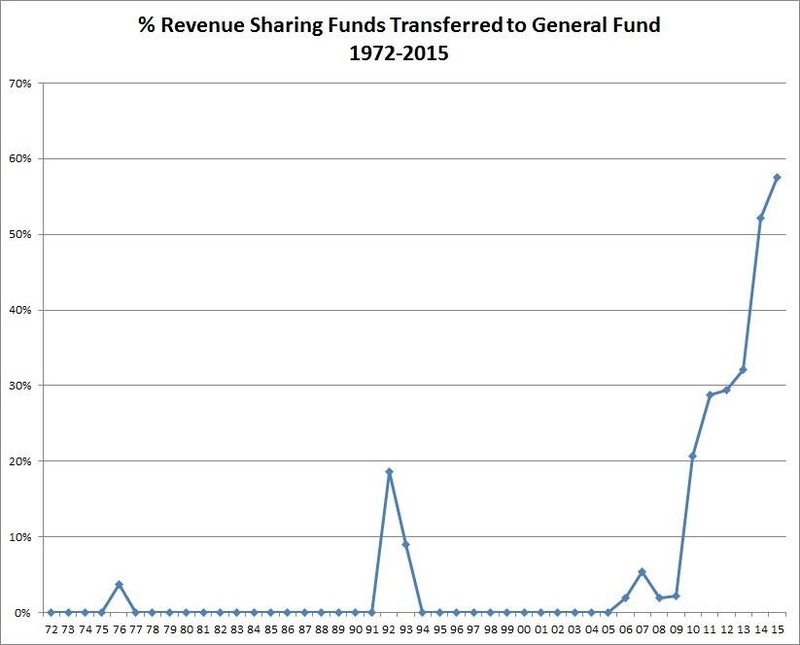 The graph above is from the Maine Municipal Association‘s tracking of what should have been turned over to municipalities under Maine statute – but which was ordered to be taken away from municipalities and returned to general state funds. You can see the amendments to the statute which provides the recent data in subsection 5-C of the statute. In other words, what the excellent Maine Today reporters fail to report is that the cut is not really an average 30% cut – it is an over 50% cut to municipal revenue sharing if you take into account the fact that legislatures since 2010 have already cut municipal revenue sharing substantially below what it is normally mandated to be. Municipal revenue sharing was first substantially cut in 2010, in response to the revenue crisis of 2009. However, it has sped up substantially since then under the 125th and now 126th legislatures. Although we missed the most dramatic cuts — since Governor LePage wanted to eliminate it altogether — we are not paying enough attention yet to the dramatic way that municipal revenue sharing has already, quietly, been transformed. This entry was posted in Maine Economy, Municipal Finance. Bookmark the permalink.